Soul music might not be what comes immediately to mind when thinking about Portland, Oregon, despite the fact that two SoulTracks favorites – Esperanza Spalding and Liv Warfield- have ties to the city. Grammy winner Spalding grew up in Portland while Warfield attended college there. Instead, most people who think of the Portland music scene may focus on rock bands such The Kingsmen of “Louie Louie” fame, The Decembrists, Everclear and Courtney Love. The city’s African-American population is relatively small – about 7 percent – but it is musically vibrant and influential as can be head in Bespeak Love, the compilation record of R&B artists who hail from Portland. Reading the biographies of the nine artists included in the Bespeak Love compilation, it becomes clear that their stories mirror those of soul singers raised in the hotbeds of R&B music such as Memphis, Chicago or New York. For example, keyboardist Chris Turner and saxophonist Eldon T. Jones played for their church choirs as well and at the city’s performing arts high school. Turner plays the keyboards on Ashley Jayy’s “Reckless” and Jarrod Lawson’s “You Got Me,” two strong ballads on a project that is distinguished by its slow jams, while Jones lends his creative sax playing to the mainly instrumental “Love Will Find A Way.” Turner’s playing gives the Jayy cut a jazz-meets-the-church flourish that plays to the vocalist’s history as a church based singer. Jayy grew up singing in the choirs of churches within the Church of God In Christ, a Pentecostal denomination that has (quite unwillingly) contributed plenty of singers and musicians to pop music. “Reckless,” is one of the many strong ballads on Bespeak Love and the rigorous training that she received in that religious atmosphere can be heard in the maturity and polish of her vocals. SoulTracks favorite Lawson is the lone white artist featured on Bespeak Love, and his story is reminiscent of how soul singers from a similar background came to the music. Lawson grew up in a musical home and gravitated toward his parents’ record collection that included albums by Donny Hathaway and Stevie Wonder. Those vocal influences can be heard on the jazzy ballad “You Got Me,” and his emotive and voice that moves easily from baritone to a fluttery tenor may remind veteran soul fans of a blue eyed soul singer from the past: Bobby Caldwell. 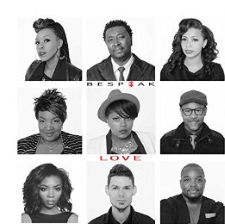 While Bespeak Love’s calling card will be the slow jams such as Ronnie’s “Beautiful,” the project also includes cuts such as Ericka Warren’s “The Best In Me,” a dance track that sports a smooth yet funky bass line, tight backing vocals and propelled by Warren’s lead singing that moves from a classic gospel inspired soul to a contemporary R&B/hip-hop styled delivery. East coast bias is a term often used in sports because teams that play their games in the Mountain and Pacific Time zones don’t receive the exposure in media centers such as New York. I suspect that the talented performers featured on Bespeak Love confront something similar in their efforts raise their profiles while living in a city far the R&B hotspots such as Atlanta, LA or Chicago. Fortunately, technology provides them with a tool that expands their reach, and will give this excellent compilation a chance to be heard in a way that would have been impossible twenty years ago. And this music should be heard; the quality of this compilation will ensure that listeners throughout the country will want to learn more, and maybe Rip City will become better known as Soul Music City. Highly Recommended.